So you’ve heard of google right? Yea i thought so. But have you heard of Bing? Nope, i thought so to. 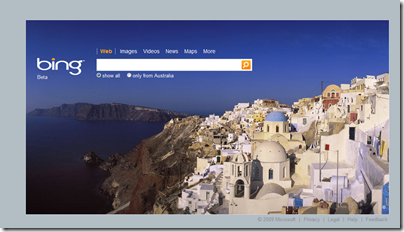 Bing is a new search engine, a new engine from the big guns, Microsoft. 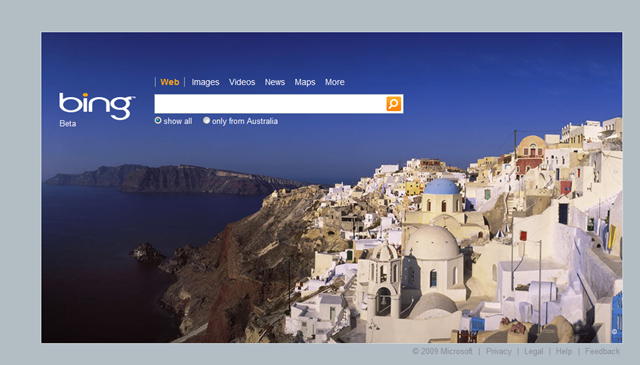 Bing is an attempt to win back some market share from google and on first appearance looks very much similar to google’s design. So whats difference? How are they going to try and win back some people? Well for starters, they give you a random big picture that looks rather nice. Cool. All i can say is more bandwidth, right? Short name. Instead of typing 5 characters, you get to type 4. That will totally save my fingers and hands from getting RSI!